Located in central Gunma, Mt. Akagi is one of the Jomo Sanzan or three famous mountains in the prefecture along with Mt. Haruna and Mt. Myogi. The mountain is also a hyaku-meizan though curiously there is no mountain named Mt. Agaki. The designation refers to the group of mountains that surround the Lake Onuma caldera. Due to its easy access the area teems with car driving tourists during weekends. A better time to visit is mid-week and if you choose to hike in from one of the remote bus stops you will be rewarded with superb forest trails. Mt. Akagi can be undertaken as a day hike from Tokyo provided you make a very early start. From Ikebukuro take a local train for Akabane and change to the JR Takasaki Line for Maebashi 前橋駅. On weekends there are three direct buses from Maebashi Station to the Mt. Akagi Visitor’s Center 赤城山ビジターセンター. If you plan to hike on a weekday, you’ll have to change buses at Fujimi-onsen 富士見温. For those looking to take the path less travelled consider taking a train to Shibukawa Station 渋川駅 and change to a Kanetsu mini van for the final leg to Miyama 深山 (45 mins, 570 yen). For this hike I left on a Thursday morning and camped out for two nights. From the Miyama bus stop look for a sign pointing to the Akagi Campground 赤城キャンプ場 a seasonal privately-run campground not to be confused with the one you’ll be staying at beside the lake. The morning’s first course of action is pacing out 7.3 km of paved road to the trailhead proper which should take a little under 2 hours. The bus driver mentioned a spate of recent bear sightings, though all I caught sight of was a tanuki (Japanese raccoon dog) prancing alongside the road. The trailhead is a nice spot to take an early lunch. From here on you’ll be following the picturesque Kanto Fureai no Michi 関東ふれあいの道. The trail to Lake Onuma 大沼 is well trodden and marked out. Where I did find myself occasionally deviating off course there was inevitably a plastic trail marker, shepherding me back in the right direction. The final section climbs along a ridge before finally meeting a road which descends to Lake Onuma. The Mt. Akagi Campground 赤城山キャンプ場 is free to use and has water and toilets nearby. Head for the sites towards the back of the campground, away from the road and the auto camping crowd. Even in late May it can feel like summer on the exposed mountain ridges so getting an early start is ideal to ward off the heat and get a head start on everyone else. From the campground follow the road in a clockwise fashion until you reach the Mt. Kurobi trailhead 黒檜山登山口. The first part of the trail is rocky and shaded and most likely slippery in the wet. Moving at steady pace should have you reaching at the upper ridgeline in around 75 minutes. From here it’s a short distance to the summit of Mt. Kurobi 黒檜山 (1,828 m) aka Mt. Akagi. 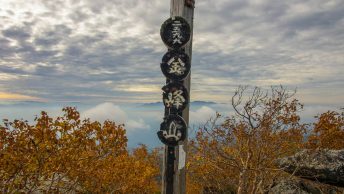 A further 10 minutes of walking brings you to the panoramic lookout with uninterrupted views of Mt.Tanigawa, Mt.Hotaka, Mt.Sukai and Nikko Oku-Shirane in fine weather. Retrace your steps back to trail intersection and look for the sign to Mt. Komagatake 駒ヶ岳 (1,685 m) around 45 minutes away. In the spring enjoy the bright purple and pale violet mitsuba-tsutsuji as you’re coming off Mt. Kurobi. The trail from Mt. Komagatake down to the road isn’t as steep as the way up with some steel staircases built into the twists and turns. After reaching the road turn left and walk up to Torii-toge Pass 鳥居峠. From the parking area pick up the trail veering up to Lake Konuma 小沼 on your right. Rather than proceeding directly to the lake a good option is to hike around the eastern perimeter which passes Kojizodake 小地蔵岳 (1,579 m). After returning to the lake take a well-deserved lunch break. When you’re ready to head off continue walking around the lake, when the trail meets the road turn left and follow the signs to Mt. Jizodake 地蔵岳. Unless you have a particular interest in communication dishes I’d give this veritable antenna farm of a mountain a wide berth. Instead follow the trail down to the Akagiyama Daiichi Ski Area 赤城山第一スキー場 which in turn picks up the main road back to the campground. Options include spending an additional night at the Mt. Akagi Campground or taking a bus back to Maebashi Station (1 hr, 1,450 yen). The nearest bus stop to the campsite is the Kojiri Kousei Danchi Iriguchi 湖尻厚生団地入口 a 20-minute walk.